The U.S. Fish and Wildlife Service is proposing that a seven-mile-long section of the Big Wood River downstream from Bellevue be designated critical habitat for the Western yellow-billed cuckoo, which was listed as a threatened species last week. The Endangered Species Act defines an endangered species as one at risk of becoming extinct. A “threatened” species is one that is likely to become endangered within the foreseeable future. According to an entry by the Fish and Wildlife Service in the Federal Register of Aug. 15, about 854 square miles is being proposed for designation as critical habitat for the bird in nine Western states. In Idaho, in addition to the Big Wood, that includes parts of the upper Snake and the Henry’s Fork rivers. Eighty-five percent of the 1,129-acres proposed for designation locally is privately owned, 8 percent is owned by the state and 8 percent is BLM land. The area extends to a point about two miles west of Stanton’s Crossing along U.S. Highway 20. The U.S. Fish and Wildlife Service states that the area is consistently occupied by cuckoos during the breeding season, and is at the northern limit of the species’ breeding range. Most nests are placed in willows. During a Blaine County commissioners meeting Tuesday, county Planning Director Tom Bergin said part of the local area proposed for designation is already protected under conservation easements on the Wood River and Heart Rock ranches. “Critical habitat” is defined as areas essential to the conservation of the species that may require special management considerations. Federal agencies are required to ensure, in consultation with the U.S. Fish and Wildlife Service, that any action they undertake within critical habitat is not likely to degrade it. Designation affects private property only when an action requires federal funding or permits. That could be the case when a property owner seeks a permit under the Clean Water Act from the U.S. Army Corps of Engineers to do dredging or fill work in the river. Gary Wright, wildlife biologist with the BLM’s Shoshone Field Office, said designation could affect livestock grazing and guided fly-fishing trips on the BLM-managed portion of the proposed critical habitat area. “We would need to see what impacts they impose,” he said. The yellow-billed cuckoo is an insect-eating bird found in riparian woodlands. According to the Fish and Wildlife Service, the Western population winters in South America and breeds in western North America. Once abundant, the population has declined for several decades, primarily due to loss of the birds’ riparian habitat as a result of conversion to agriculture, dam construction, river flow management and riverbank protection. Overgrazing and invasive exotic plants have also contributed to declines. 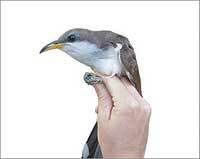 The agency is seeking information concerning the yellow-billed cuckoo’s biology and habitat, threats to the species and current efforts to protect the bird. It is also seeking information on potential economic effects of the proposed designation. Comments can be submitted online at www.regulations.gov. The docket number for the proposed rule is FWS–R8–ES–2013-0011. Comments can also be sent by mail to Public Comments Processing, Attn: FWS–ES–R8–2013–0011, Division of Policy and Directives Management, U.S. Fish & Wildlife Headquarters, MS: BPHC, 5275 Leesburg Pike, Falls Church, VA 22041-3803. Comments will be accepted through Oct. 14.